Survive and advance is the motto that the Joliet Generals will have to rely on this weekend. Today, the Generals bounced back from a 13-8 loss to the Southland Vikings and defeated the Vikings 9-2 at Wayne King Field. The win keeps Joliet in contention for the fourth and final playoff spot in the Midwest Collegiate League. After recent rough performances from their starting pitchers, Joliet needed a strong outing today from Brock Budzielek. He delivered in his best outing of the season. The right hander gave up two unearned runs on eight hits, needing only 83 pitches in seven full innings of work. “I was just focused on throwing strikes and letting my defense do the work,” said Budzielek. Generals manager Joe Hernandez echoed how impressive Budzielek was. While his team helped him out defensively, they also provided more than enough run support. The Generals scored three runs in both the first and third inning, thanks to the two-three-four hitters. 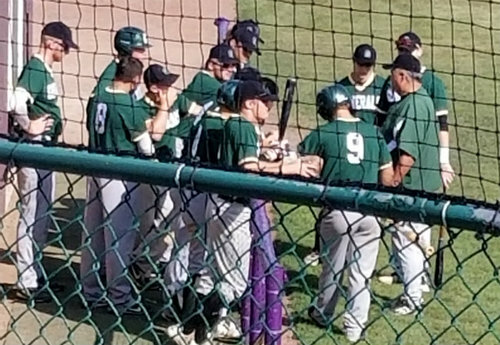 After three innings, Joe Scaffidi, Jack Krause and Jeremiah Lebron had combined to go 5-5 with two doubles while accounting for all six of the runs scored. In the middle innings, consistency was key. Joliet scored one run apiece in the fifth, sixth and seventh. That amounted to a healthy margin for Josh Nowak to close things out. Normally a position player, Nowak, who pitched yesterday, threw the final two innings for the Generals. In the ninth, he faced the top of the Vikings order and struck out all three batters to end the game. His effort allowed Hernandez to save his pitching staff for tomorrow and Sunday. Knowing the playoff implications at stake, Hernandez had this to say to his team after the victory. The Generals need to win out in order to make the playoffs. That starts tomorrow with a huge doubleheader against the fourth-place Bloomington Bobcats. If they win both meetings, all the Generals would need is a win Sunday versus Southland to steal the final playoff spot. Game one of the doubleheader will begin at 1pm at Wayne King Field. The second game is scheduled to start at 4:30pm but may begin earlier depending on the first contest. Both games will be streamed on the Joliet Generals YouTube channel.